Missiles have been fired from Afghanistan into Pakistan, killing at least eight people in a suspected hideout for Islamic extremists. The suspected Islamic extremists were killed when two missiles hit a house in Pakistan’s tribal area in the South Waziristan town of Wana. 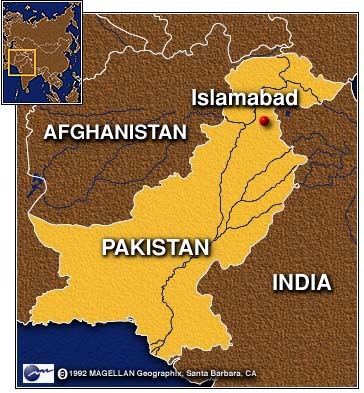 Pakistan security officials say the town is a known haven for Taliban and Al Qaeda rebels and confirmed the missiles came from Afghanistan. Residents say the owner of the house was pulled from the rubble and many people fled because planes were flying overhead. The missile strike against the suspected militants in Pakistan is one in a recent series of attacks attributed to United States-led forces or the CIA. Last week, a suspected US coalition strike on an extremist training camp in the area killed at least 10 Islamic militants. At least nine Turkish soldiers were killed and two others injured after their military vehicle ran over a roadside bomb near a bridge in Kemah, Turkey. Originally, eight were reported dead, but one of the injured later died at a local hospital. Governor Ali Gungor of the Erzincan Province has stated that after the explosion, the vehicle was attacked. Reuters states that militants with the Kurdistan Workers’ Party were responsible for the attack and that military personnel were searching for more attackers. The attack occurred in an area where Turkey has been frequently fighting militants of the PKK. Recently, the Turkish military launched airstrikes in Iraq in an attempt to disable the group. Turkey has been fighting militants of the PKK since 1984. The Associated Press reported early Friday that a camouflaged gunman opened fire, killing three, on a northeast Wisconsin river Thursday night. A fourth person was wounded when the gunman opened fire at about 5:30 p.m. The four victims had gathered to go swimming near the East Kingsford railroad bridge over the Menominee River near Niagara, Wisconsin. The river forms the border between Wisconsin and the Upper Peninsula of Michigan. The suspect used a military-style assault rifle from a distance of 7 to 10 feet from one victim, Marinette County Sheriff Jim Kanikula said. The alleged gunman, Scott J. Johnson, 38, of Iron Mountain, Michigan was taken into custody at about 8:30 a.m. local time approximately 100 yards from the bridge where the shootings occurred, according to early reports. The Daily News reported that the suspect surrendered into police custody. At 9:43 a.m. the search was ended by authorities after a suspect was captured just after 9:00 a.m. CDT Friday. At 12:25 p.m., the Star Tribune released the name of alleged gunman. The Star Tribune and the Associated Press reported the names of the victims: Tiffany Pohlson, 17, Anthony Spigarelli, 18, and Bryan Mort, 19. Twenty-year-old Daniel Louis Gordon was wounded. All were from Michigan. The four victims were part of a group of nine young adults by the bridge. The Star Tribune reports that there was no communication between the attacker and the group. Johnson is in the Marinette County Jail awaiting an arraignment hearing that has yet to be scheduled. Agence France-Presse reports that about 30 people were evacuated from the area. Niagara is about 210 miles north of Milwaukee, across the state line from Michigan’s Upper Peninsula. Owatonna, highlighted in red shown within Steele County and Minnesota. At least eight people have been killed in a plane crash near the southern Minnesota town of Owatonna, the Associated Press and local media reported Thursday morning. One person, who had been listed in critical condition as of 11:40 a.m. in the Owatonna hospital has died from injuries sustained in the accident, the Associated Press reported just before 3:00 p.m. that afternoon. At least one person is unaccounted for while investigator determine whether the person boarded the plane in New Jersey, according to the Steele County Sheriff’s Office. The Raytheon BAE 125-800A commercial jet, seen here in 2007, crashed in Owatonna on July 31, 2008. Kare11-TV and the Star Tribune report that charter flight 81, a Raytheon BAE 125-800A commercial jet, was trying to land at Owatonna Degner Regional Airport just after 9:30 a.m local time en route from Atlantic City, New Jersey. The plane was owned by East Coast Jets Inc. of Allentown, Pennsylvania. Aviation Research Group told the Star Tribune that East Coast Jets operates 11 aircraft — Hawker and Lear jets — and employs 21 pilots. This model of aircraft “has a very good safety record; been around along time,” said Gary Robb, aviation expert and attorney with a Kansas City law firm that represents aviation crash victims. According to the Star Tribune, the pilots have been identified as Clark Keefer of Bethlehem, Pennsylvania, and Dan D’Ambrosio of Hellertown, Pennsylvania. Pilot error has not been identified as a cause for the crash, but investigators caution it is to early for any conclusions to be made. Graphics released by the Star Tribune show that the plane ended up past the runway it was attempting to land on. The Associated Press reports that debris was scattered 500 feet beyond the runway. The bodies have been taken to Rochester, while the plane’s data recorders have been flown to Washington, DC. The plane, a charter for Viracon, Inc. of Owatonna, was flying customers from “a couple of different companies” to discuss a $2 billion dollar casino and hotel project in Las Vegas, Nevada that Revel is building. Atlantic City Mayor Scott Evans told the Associated Press that two high-level employees for Revel Entertainment and an employee of Tishman Construction. Viracon is an architectural glass fabricator and Tishman is assisting Revel. The Tishman empoyee, the only victim identified, was project manager Karen Sandland, 44, based in Newark, New Jersey company spokesman Bud Perrone told the Associated Press. 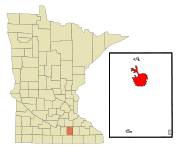 The crash is the deadliest in Minnesota since October 2002, when Minnesota Senator Paul Wellstone and seven others died after their chartered twin-engine plane crashed in the woods near Eveleth, in Northern Minnesota, according to the Star Tribune. The National Transportation Safety Board (NTSB), an independent agency responsible for investigation of accidents involving aviation, highway, marine, pipelines and railroads in the w:United States (except aircraft of the armed forces and the intelligence agencies), will be investigating the crash. The NTSB reports two other fatal accidents since 1962 at Owatonna airport. A crash in 1992 killed one and injured another and a crash in 2004 killed four people.